This will not be a decisive election and I fear that out of the chaos will come, well… more confusion. I am not against coalition government in principle and I instinctively welcome the idea of more plural politics. I would love to see the self-indulgent wishfulness of nationalism (SNP, Ukip) and lifestyle idealism (Green Party) exposed to more rigourous scrutiny and the test of having to be engaged in gritty decision-making. They might inject some fertility into the near-moribund anatomy of the main political parties. Firstly, as a media person I am so bored by the tight-arsed failure of the parties to embrace the possibilities of digital media — but also mainstream media — to have a full, frank and entertaining debate about politics. It’s been a dull, stupid, bland, campaign. The broadcasters have been slavishly compliant in the relentless photo-opportunities, too lazy even to go for the odd wide shot to expose the visual chicanery involved. The faked moonlanding conspiracy has nothing on this election. Secondly, I share the view of people like Andrew Marr, Adam Boulton and Martin Wolf that the big issues have been ignored. Not just in the avoidance of detail. The Tories won’t tell us the welfare cuts to come. Labour won’t describe the tax rises that must follow. But more importantly, why won’t anyone talk about our core economic problem: productivity. Everything else flows from that including re-imaging hot topics such as immigration, education and housing. Thirdly, we are heading for a mess. I don’t buy into the ‘legitimacy’ or ‘coup’ hysteria. This is politics, chaps. If you can get a majority then you rule for as long as it lasts. But if — for one moment — you assume that neither Labour nor Tory will ever bestride the political landscape like a colossus again — then what follows? Both Cameron and Miliband seem prepared to do anything to get the keys to Downing Street. Fair enough, but I have no sense that either of them have any idea what they will do with it. Not just in policies, day by febrile day. But where are they headed? This is an opportunity to build some kind of new arrangement: of either a Realistic Right or a Progressive Front. But just when British politics was supposed to open up, I fear that like this control-freak election we are heading for a frightened, fractional administration. At least one group of people apart from politicians and civil servants are busily preparing for what looks like the inevitability of coalition, or minority government. At a breakfast briefing debate a number of public relations or public affairs professionals said that this was a massive opportunity for their industry. The logic of this was put most succinctly by former government communications civil servant Vickie Sheriff, now a PR at drinks colossus Diageo. She said that any government with a fragile hold on power will bring in less legislation and it will be less contentious. So as Nick Williams from Fleishman pointed out, backbenchers and small parties will have more leverage to alter details and that is a chance for lobbyists to make their case and get influence for their clients. Mark Pack from Blue Rubicon also pointed out that the Lords will have more influence with its blocking power which means that the PR professionals should also be targeting the place-people of the second chamber. You can decide if all this enhances democracy and transparency, or not. That partly depends on the ability of political journalists to tap into the much more complex webs of influence and interest that will be spun post-May 7th. I think that it means the Westminster bubble will get a little bigger, much more complicated and even more intensely apart from public discourse. Journalists will have to abandon knee-jerk political instincts and follow the money. 4. ‘We are all going to have to get used to tracking a much wider range of opinions and issues’ said Iain Anderson, boss of Cicero Group. 5. ‘The public still like strong leadership and the strong leader this election is Nicola Sturgeon’ said Vickie Sheriff who added that women voters are particularly attracted to the SNP leader but will other parties recognise the electoral power of powerful women in charge? Watch loads of our leading political journalists discussing the election campaign, how they are covering it and its significance politically. These are the videos of the main sessions at the recent Polis annual conference at LSE. It features Andrew Marr, Adam Boulton, Anne McElvoy, Isabel Hardman, Miranda Green, Tim Montgomerie, Rafael Behr, Mary Riddel and many more. Paradoxically, journalists are even more fascinated in the polls this election because they are not moving much (at least for the main two parties). Hence, a poll that reports a six point gap suddenly looks like a headline. And yet, as you can see from this Telegraph report on the Guardian’s ICM poll today, it is actually Labour ahead in the poll-of-polls rating shown alongside the headline saying ‘Conservatives have 6 six point lead’. There’s nothing particularly wrong with the Telegraph’s version. Although amusingly, the Labour sympathetic Guardian reported its own poll much more cautiously. The main point to take into account is margin of error. Even that 6 point lead dissolves if you remember that the rating for either Labour or the Conservatives could be 2-4 points either way. Another poll (by Lord Ashcroft) reported just a few hours later showed the parties neck and neck. I suspect that one won’t get headlined. This kind of febrile excitement at what people tell pollsters is partly to do with 24/7 online news that means that every straw is clutched at in an attempt to make sense of a complex and close race. One cynical journalistic reaction is to remind everyone that campaigns rarely shift opinion from where it was months ago. ‘Calm down dear, it’s all structural’ they say. However, I think that this time it is different with so many more undecided voters who might switch allegiance (what pollsters call ‘churn’) and so many minor parties who might have some kind of impact on individual seats. Tactical voting will be much more widespread. So small shifts – however isolated – should be noted with caveats and within the context of aggregated figures for different polls. But they should not be mis-translated into some kind of narrative, let along one of causation. It’s pretty unlikely that, say, an inheritance tax announcement will provoke an instant poll rise. But I fear that the public will be left confused by journalists who over-interpret polls’ significance only to see the wind blow the straws back in the opposite direction a few days later. 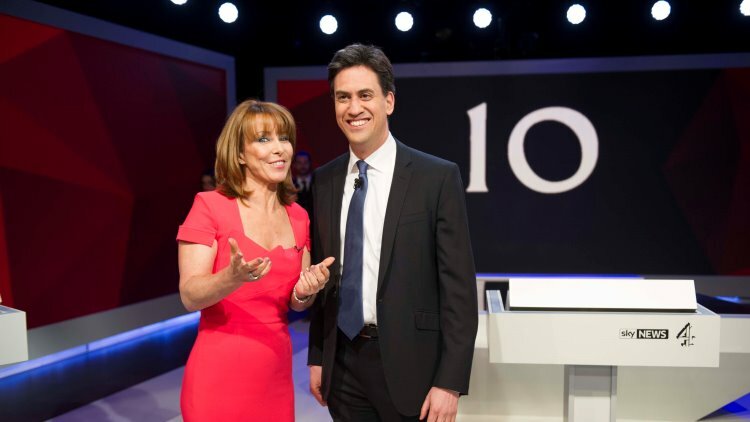 TV is definitely not as obviously dominating this election as it did with the novelty of the first TV debates in 2010. But I sense a new complex reality is emerging that sees the broadcasters still setting the pace. The asymmetry of the ‘debates’ was confirmed by the fact that there was another one tonight in Scotland. Yet despite getting smaller viewing figures they are still the most interesting bit of theatre in this campaign. And despite all the stage-management, they have also been the most ‘authentic’. Alongside that there are plenty of other broadcast events including a series of ITV Tonight domestic specials, Daily Politics policy debates with minister level politicians, as well as the regular Newsnight, BBC Question Time and Channel 4 News coverage. Plus Sky News. All the time. Then add in a whole load of social media reaction to those broadcast set-pieces. And a regular dose of photo-opportunities involving lambs and haggis and you have a ‘feast’ for the eyes. The newspapers have tried to interrupt this visual flow. They have even tried to make stories out of the broadcasting. Hence, the Sun’s over-blown excitement over Ed’s ‘Happy Warrior’ prompt notes. We’ll have another look at who is gaining most from this another time, but it’s clear that the TV debates to come will have a tactical impact. Even if the audiences are relatively low they effect perceptions because they are amplified through the newspapers and social media. Meanwhile, the papers just aren’t getting traction from a tight-lipped campaign of the sort that the BBC’s James Landale found in Cameron’s kitchen. This campaign is the most-scheduled ever. We’ve had grids before but never five years to prepare thanks to fixed term parliaments. The Easter weekend break is going to be quieter but vital in media terms. Firstly, it comes after the first leaders’ ‘debate’. Secondly, it is a strange interlude where most people will go on holiday and ground campaigning will quieten. But journalism abhors a vacuum and so expect it to be quite a febrile Bank Holiday in the papers as polls emerge showing that the public mood is twitching again. This will contrast with what has been a text book formal campaign. Labour launch a poster showing business backs them. The Conservatives have a letter from business leaders saying they back them. The papers divide dutifully along party lines and the broadcasters cover it. Although to be fair, the Times also led on market wobbles about a hung parliament and the tabloids are bored already and went in search of lottery winners and new health scares. I deliberately didn’t take detailed notes during our conference on journalism and elections because I wanted to pay attention and get a broader impression of the arguments. We will have video up online later but search the #polis2015 hashtag and you will see there was a vast amount of perceptive comment by the speakers about the campaign and the way it is being covered. For me there were three key messages: 1. 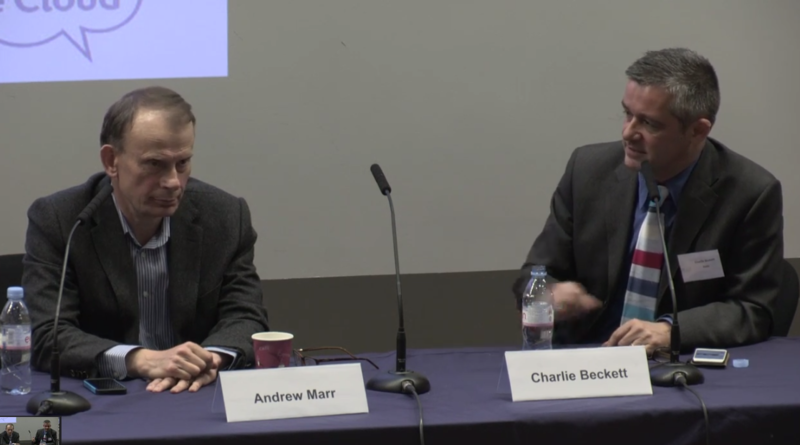 Andrew Marr said journalism had to be ‘humble and open’. This is partly about social media, but really it is more about journalism realising that it is in danger of losing trust and needs to work harder at serving the public. As Buzzfeed’s Jim Waterson warned, the public see journalists as part of the political establishment that so many of them now loathe. 2. 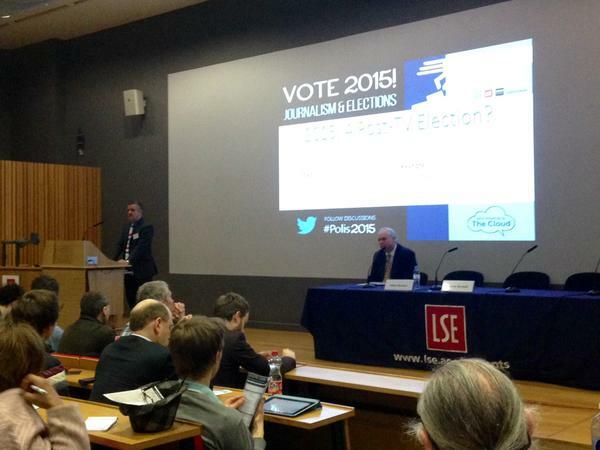 Adam Boulton said that political journalism had to be more serious. There’s too much complicity with politicians and not enough attention paid to the big issues at stake. 3. Many speakers made the point that this is an election with 200 battlegrounds, not just a few marginals. So it is vital that the news media gets way beyond the Westminster Village. There are so many aspects to this complex election with emergent parties and asymmetric narratives that the old ways of reporting campaigns just won’t work. I made most of my detailed comments on The Sky/Channel 4 News programme with Cameron and Miliband on Twitter as it happened. It was a lively but flawed start to the broadcasting campaign. The interviews by Paxman were strong and put both men on the spot, but inevitably Paxman couldn’t help sneering. The audience question sessions were almost pointless. However, I am not sure a head to head debate would have been much better. At least they weren’t so able to resort to the usual slogans when faced by Paxman and the public. The fact that only 3 million watched looks better when you see that 20% were 16-24 year olds and that there 500,000+ tweets during the show. Politically, both men probably got what they wanted. 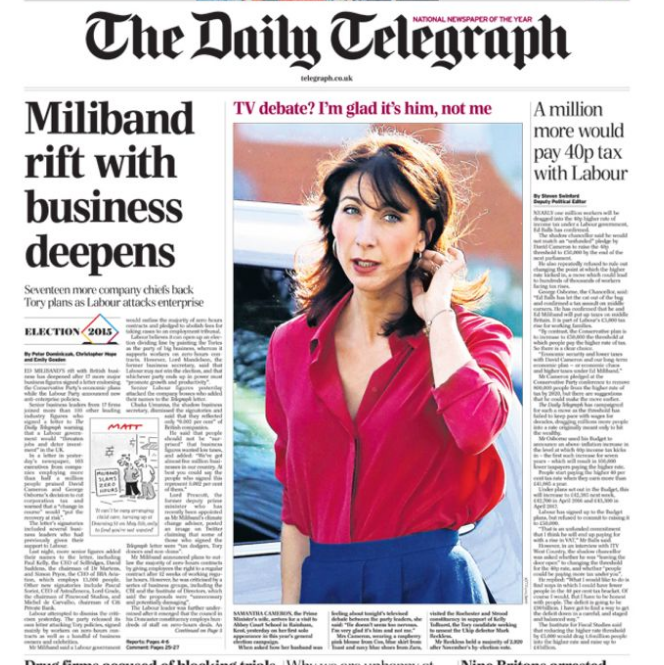 Cameron avoided gaffes and Miliband looked more interesting than you might think. Post programme polls suggested narrow approval for the Prime Minister which is a relative triumph for Miliband and will galvanise his troops. Cameron may actually have confirmed doubts on his own side following the unnecessary kitchen confession to the BBC’s James Landale that he won’t go on beyond 2020. At the Polis Conference Sky’s Andrew Boulton was highly critical of the domestic drama approach to political reporting. And at the same event, Andrew Marr criticised the aggressive and sardonic approach adopted by Jeremy Paxman. Real News Disrupts Election Campaign Shock! The Jeremy Clarkson Top Gear episode reminds us that ‘real’ news stories will disrupt the plans of political journalists as well as party communications officials during an election campaign. We think of the 2010 campaign as being dominated by the TV Elections debates but other non-political stories often led bulletins and front pages: the crash of the Polish airliner carrying a group of that country’s elite; the eruption of the Icelandic volcano disrupting air traffic; as well as Catholic scandals, riots in Greece and the birth of conjoined twins. Today’s story about a celebrity getting the sack for assaulting a BBC colleague will distract attention away from that rare thing: a real political announcement at PMQs. In the last session of this ridiculous weekly ritual Prime Minister Cameron ruled out raising VAT in the next parliament, matching Labour’s high-profile pledge on the same subject. Fox shot? Of course, thanks to the Internet there is no shortage of space to report the tax arguments in the election, but this kind of non-political story does help mix up the narrative in a way that must annoy the political professionals. At the moment we have such as risk-averse campaign by the two main parties that it is the perfect moment to get them to cave into any demand. But as we saw with the Lib Dems and tuition fees, government, especially coalition or minority government at a time of austerity may means pledges turn into fairy dust. Has there ever been an election when the public simply don’t – and can’t – know what they are really voting for? 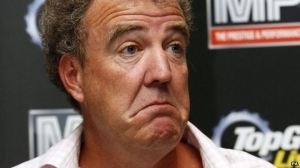 At least the million plus people who signed the petition calling for Clarkson to keep his job had a simple demand. Sadly for them, they didn’t get what they wanted either. There are always a couple of unscripted, revealing moments in even the tightest, most orchestrated campaign. 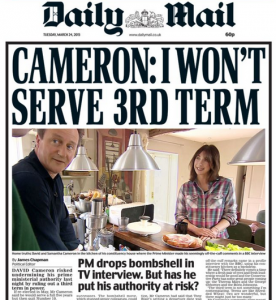 David Cameron’s Cotswold kitchen interview with James Landale in which he confirmed what most people expected, that he won’t serve a third term, was one of them. Westminster veterans have pointed out that few people expected Cameron to go on beyond a EU referendum anyway but this ignores a cardinal fact of politics: the art of rhetoric. The fact that you have said something out loud and when you say it that often matters more than the content of what you say. I don’t think this is damaging in the way that Gordon Brown’s 2010 ‘bigoted woman’ outburst hurt him. 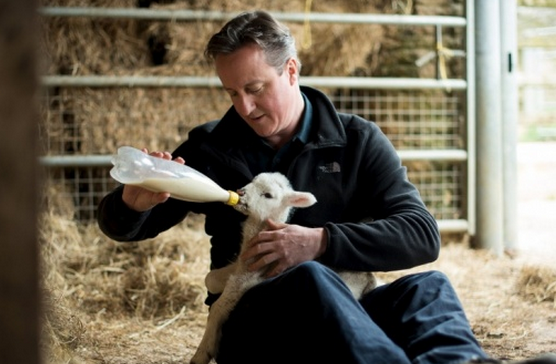 It might even reassure voters that Dave is nice bloke who won’t go on and on. But as political commentator Steve Richards always says, events like this have their own momentum and create uncertainty that can’t be dismissed with reasoned explanations. Cameron had no need to say what he did. It would not have been deceitful to have dismissed the hypothetical question. No, there won’t be much more speculation than there already was going to be about his successor. But the authority that comes with office has been jolted. He has literally told his party and the voters to start thinking about when he will be gone. Tony Blair’s former spin doctor, Alastair Campbell, asked Conservative chief whip Michael Gove the key question on BBC Newsnight last night: “How does it help you win a second term by having this discussion now?” John Rentoul answers that by saying the slogan, ‘Vote Dave, get Boris’ is a way of maximising the Tory vote. There was some scepticism from Sky’s Adam Boulton as to whether this was a storm in a Westminster tea cup. He’s right. This is about process and jostling for position internally, not a great policy issue. However, all the newspapers from tabloid to broadsheet have splashed on it. It is another example, I suspect, of BBC News boss James Harding’s strategy of getting his journalists to deliver more scoops. Leadership matters, especially in a presidential age where the character of politicians and the ‘authenticity’ of populist figures such as Nigel Farage is important. I have written elsewhere about how this will be a very tight, arid, campaign because it is so close. No-one wants to take risks. 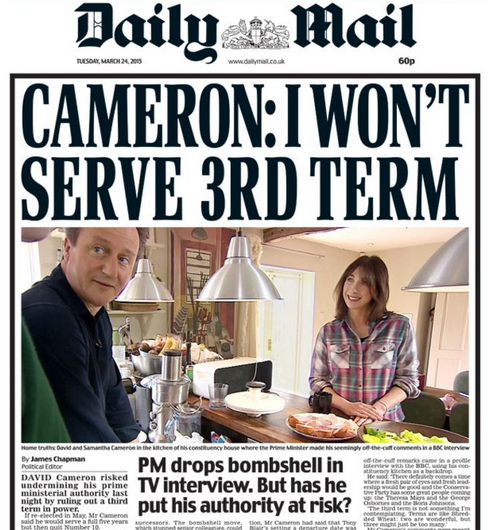 So it’s all the more surprising that Cameron allowed himself to splurge on this story with so little prompting. About: This is a rolling blog post that will be updated regularly but irregularly (if you see what I mean) over the next six weeks as the long UK election campaign that started after last autumn’s Scottish referendum, that accelerated from New Year and then goes into formal process from Monday March 30th. I will be looking especially closely at broadcasting because Polis is carrying out research on TV and radio news coverage for a publication after the poll. But I am also very interested in how social media and newspapers will contribute to the networked election news. Back in 1992 I produced the BBC’s behind-the-scenes election documentary and so spent that campaign with the various party machines on the road. It was the age before the Internet and mobile phones had their dramatic impact upon journalism. But we were going digital. It was one of the first long films edited digitally on the Avid system and thank God it was. Everyone in that campaign thought the Tories were going to lose until the surprise result meant that we had to re-edit our rough cut film to reflect the triumph for John Major. I think that this year’s election is the most dramatic since then in terms of the closeness of the race. It feels even more important for what is at stake for the parties involved and the country in terms of the economic, social and constitutional future of Britain.